Last month I have written a post on Renko trading system in the Nifty index. You can read the post here: 2 Ways To Minimize Whipsaw Using Nifty Renko Charts. In this post, I will discuss how to open Renko charts on Sharekhan Trade Tiger. Apart from TradeTiger, Zerodha Pi and Zerodha Kite both also offer good Renko chart. 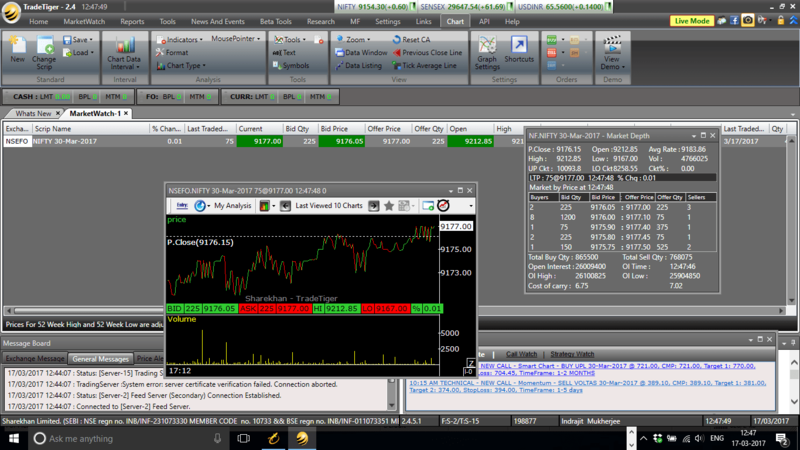 First run and login to Sharekhan Trade Tiger. Open a blank market watch. Now I will add near months Nifty future scrip by choosing DERIVATIVES then SCRIP –> Nifty, EXPIRY –> Near, INSTRUMENT –> Futures. Click on the show. It will show the Nifty 30-Mar-2017 futures. 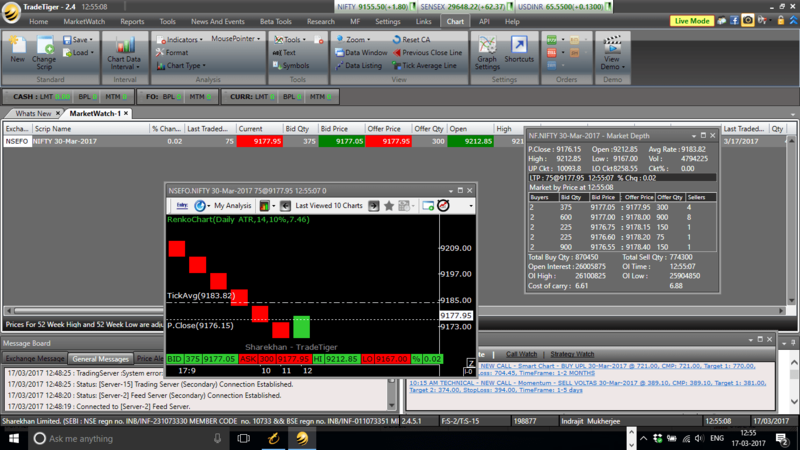 Next click on ADD and the script will be added in my market watch. Now right click on the scrip, select CHART and select VIEW CHART (Ctrl+G). This will open the Nifty future tick chart in the Sharekhan Trade Tiger terminal. You can also double click on the scrip to open its chart. Now right click on the tick chart. 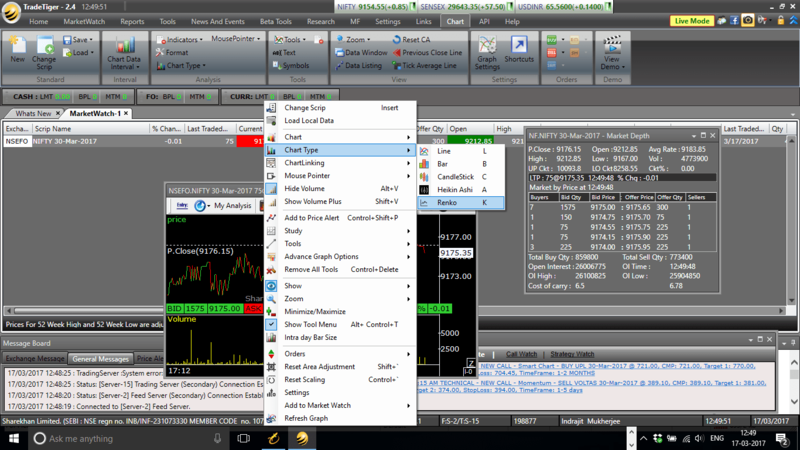 Select CHART TYPE and select RENKO (Keyboard K). This will open the renko chart for the day. The chart will look like the following image. Now we need to increase the backfill time, instead of the single day, you can change the chart period 5 days OR 30 days. Click on the extreme bottom right square in the chat box. As shown in my image below. 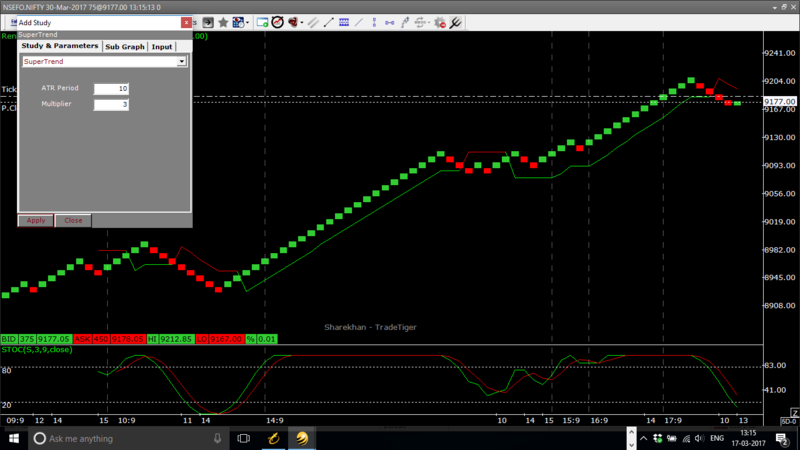 Now Renko chart is live final touch needed is to create the Renko Trading System adding studies. To add study right click and select STUDY –> ADD STUDY. You can add Stochastics OR Super Trend as the study. Entry-exit can be done on either 1) on the basis of Stochastics overbought / oversold and turning from there OR 2) on the basis of Super Trend signals. So your Renko trading system is ready on TradeTiger. You can send in your questions through the comment box below. Things to remember: Renko charts are still on the R&D stage in most trading terminals. Readers can point us to any bug they notice. How will manage stop loss and if make it more than 1 brick in little time what should we do ? Manju, you can keep SL as per super trend OR can watch my other article here: 2 Ways To Minimize Whipsaw Using Nifty Renko Charts. Happy trading!! What is the recommended value for NIfty and BankNifty in points for creating the size of each brick? Does TradeTiger,Kite or Pi enables us to set this value as 14 period ATR? Parikshit brick size depends on traders to traders. As per my observations I prefer 10 points brick in Nifty, 20-25 points brick in Bank Nifty. Zerodha Pi OR Zerodha Kite can set default brick size for you. Not yet checked that feature in Sharekhan. Rajan, definitely renko is in my chart setup. I use a combination of Renko Donchian channel and stochastics. Check this post 2 Ways To Minimize Whipsaw Using Nifty Renko Charts. do you trade regularly with renko + supertrend. does it benifit you. this donchain channel is not available in sharekhan tiger, how do you think one should trade in the absence of the same. Also Tiger does not have brick size specified..
Prashant consider switching to Zerodha Kite ASAP. You can visit this page to join Zerodha. is there any screener available for buy/sell signal ? 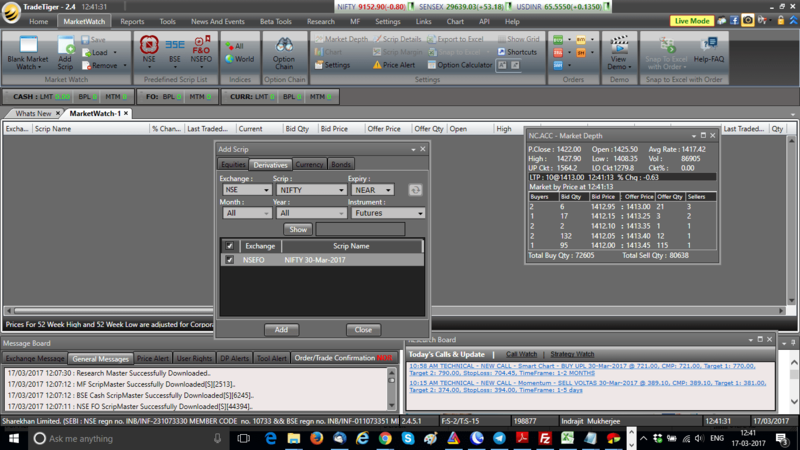 You can check this NSE stock screener.